We are Chicago wedding planners that coordinate beautiful, fun weddings and events in Chicago and destination weddings around the globe. With over 400 weddings and events brilliantly planned, we help make your wedding day spectacular. Every couple has a unique story to tell, and your wedding is the perfect opportunity. Be it a hometown wedding in Chicago or a destination wedding, we specialize in translating your vision into an amazing experience for you and your guests. There's no wedding like a big-city wedding right here at home in the Windy City of Chicago. We love to plan destination weddings! Be it beach, villa, castle or beyond, we have experience working all over the world. We have 15 years of experience planning South Asian weddings and events all over the world. Travel is a personal passion for Ali and her team, and they bring that enthusiasm to destination wedding planning around the globe. From a romantic, old-world castle wedding in the English countryside to colorful beachside fetes in the Caribbean or Mexico, Ali seeks to showcase the best in any destination, and create an unforgettable experience for the couple and their guests. You'd be hard pressed to find as many amazing venues and options as Chicago for your wedding. Ali Phillips' unparalleled contacts across the windy city give her access to the city's best venues and vendors, and her longtime experience working in her hometown makes her a whiz at logistics. South Asian Celebrations -- Anywhere! A four-day party for hundreds, anywhere in the world? No problem! 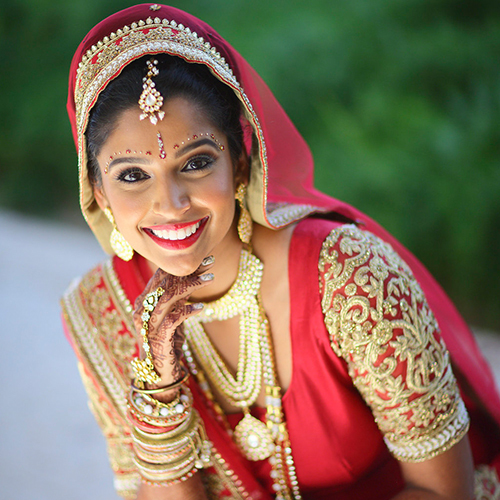 Ali and her team have produced elaborate events for South Asian couples in Chicago and beyond, and embrace the experience from start to finish. Securing the cultural details is the challenge that inspires her, while getting to know each family intimately is the emotional reward for these elaborate affairs.